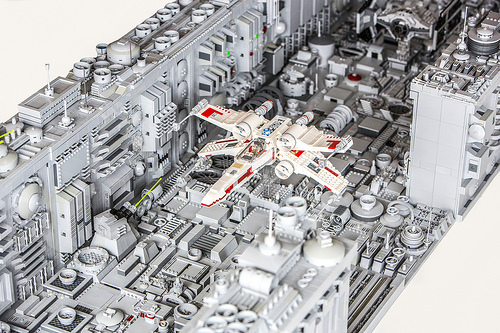 There have been many LEGO versions of the famous Star Wars trench run, and this one in minifig scale by Martin Harris 1 appears to have all the ingredients just right. This massive and highly detailed diorama with X-Wing, TIE Fighters and Darth Vadar’s TIE Advanced X1 is a feast of grays and shadows. At a length of 8 feet (2.4 meters) it’s hardly surprising that completing it took nearly a year and every gray tile and plate Martin and his son had in their collections. 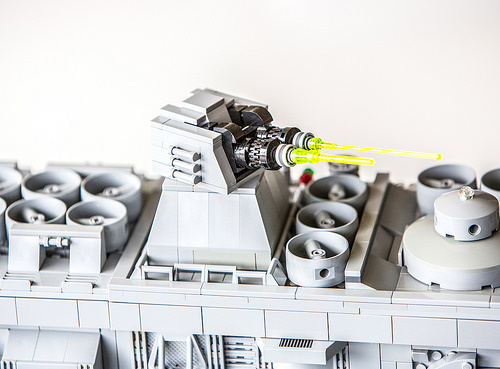 Built for Brickfair Alabama, there are viewing windows cut out of the trench to allow us into the action, as accurately replicated turbolasers shoot at (and miss) Luke Skywalker as he hurtles along the surface of the Death Star with the Empire hot on his tail. There are so many fantastic techniques and bricks used to create the complex detailing of the trench. I found myself spending a long time appreciating the various shapes and greebling throughout the trench. Martin must have watched this scene a thousand times as he appears to have captured it perfectly. It even comes with a thermal exhaust port no bigger than a womp rat! A fantastic representation of the infamous cinematic climactic battle. I agree this so needs to be submitted! !